Manual Lymphatic Drainage (MLD) is a medical massage modality that has been used for nearly a century in Europe to help circulate lymphatic fluid. The method was brought to the United States in the 1980’s by Dr. Lerner after his patients were going to Europe for relief from swelling following mastectomies. Originally invented by Dr. Vodder for sinusitis, research has since shown the lymphatic drainage is important for our entire body. Yellow Marigold has two therapists certified in the Vodder Method of MLD. Both were trained by one of the first massage therapists hired by Dr. Lerner to learn and practice Lymphatic Drainage in the United States. Investing in Lymphatic Drainage is investing in your health. Full body 30 minute session. Recommended for those looking to see what lymphatic drainage is and for an every 2-3 month maintenance after a full round of Whole Body Lymph. Full body 50 minute lymphatic drainage session. Recommended for everyone, but especially for individuals with lymphedema, lipedema, general inflammation, digestive issues, and autoimmune disorders. 50 Minute Lymphatic Drainage Facial. Recommended for acne, rosacea, headaches, migraines, facial swelling, glaucoma and sinusitis. Immediately notice less swelling and more lively complexion following your session. In order to fully benefit from lymphatic drainage, we need to see you for about 3-5 consecutive days to fully flush out all toxins and get the lymph flowing. In extreme lymphedema cases, we will need to see you daily until the swelling stops going down which indicates that all fluid has been drained. Unlike blood which is pumped throughout the body by the heart, our lymphatic fluid has no pump to keep a constant, healthy flow. The lymph is moved along with help from muscle contractions during exercise. 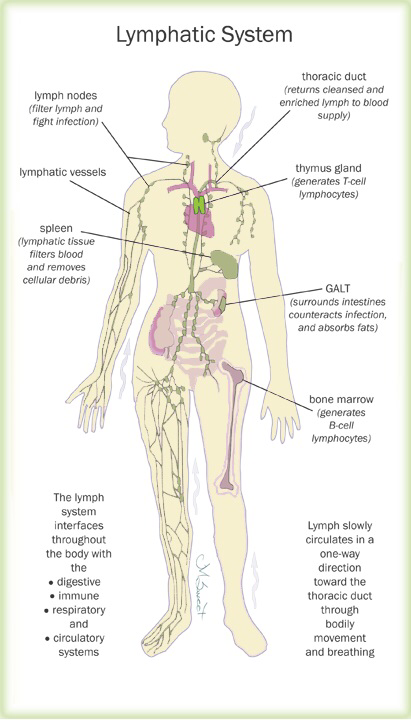 You can help lymph flow by receiving lymphatic drainage sessions and drinking plenty of water. ​Click the “more information” button at the top of the page for more on the benefits of lymphatic drainage.